The ACA saved a lot of lives and delivered health insurance coverage to millions of Americans, but facts are inconvenient for Trump supporters. No doubt you’ve heard about Donald Trump’s latest move in his series of vindictive acts against President Obama — a new attempt to overturn the Affordable Care Act. Seemingly out of the blue, and against the advice of his own attorney general and Health and Human Services secretary, the Trump administration now says it will back a federal judge’s ruling on a lawsuit filed by 20 GOP-led states that the entire ACA is unconstitutional and should be thrown out. The announcement came in the form of a short letter from three Justice Department lawyers to the 5th Circuit Court of Appeals, which is now considering the case after a conservative, GOP-appointed judge in Texas made the original ruling in December 2018. Never mind the fact that the ACA has been upheld by the U.S. Supreme Court. The votes of Trump’s two appointees, Justices Neil Gorsuch and Brett Kavanaugh, would merely be trades for two justices who voted to kill the ACA and who are no longer on the court, the late Antonin Scalia and the retired Anthony Kennedy. There’s little reason to believe that Chief Justice John Roberts would change his vote if and when it reaches that stage again, even if the absence of the health insurance mandate changes the tax issue. As many pundits and just about every Democrat has pointed out—gleefully—by putting ACA repeal back on the table, especially with no substitute, Trump has handed Democrats a winning issue in 2020. Guess that’s what happens when you go golfing and listen to Lindsey Graham, who apparently sold him on the idea at Mar-a-Lago. Even worse, Trump is putting Florida GOP Sen. Rick Scott in charge of his new “party of health care” effort. Because what could possibly go wrong when you put the former hospital system CEO who oversaw one of the biggest cases of Medicare fraud in history? The guy whose hospital system admitted to 14 felonies related to fraudulent billing and practices under his leadership, while he escaped with $300 million? In another move that makes zero sense, Trump now says that the GOP will deliver a new mythical health care plan after the 2020 elections. Sure, because that’s what voters really want — their health insurance taken away without any idea how to replace it. 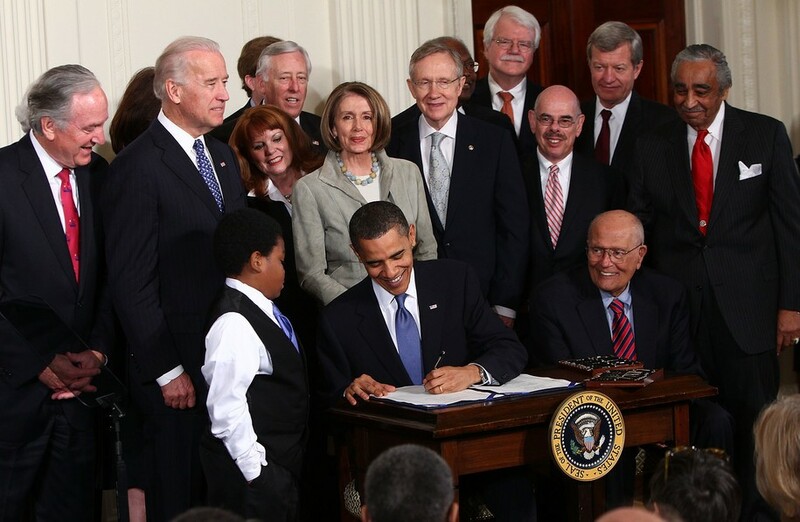 Better access to health care consistently polled as the No. 1 issue for Democratic voters in 2018, especially when it came to continued coverage of preexisting conditions. That was true across the board, and specifically in possible swing states such as Nevada and Florida. 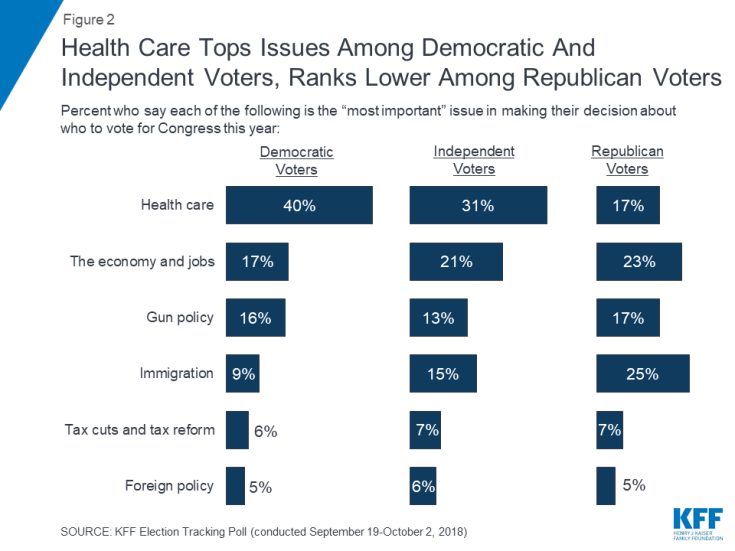 Health care ranked lower, however, with Republican voters, who are still stuck on immigration as their No. 1 concern. But in the end, Trump voters won’t care. They’ll vote for him anyway. Trump and his administration are trying to take health care away from tens of millions of Americans — again. Potential candidates are touting varied proposals on Medicare for all vs. an optional Medicare buy-in. But the Democratic messaging after Trump’s new wacky move was simple: “Build on Obamacare with a public option.” Democrats are introducing a plan that would strengthen the ACA and expand health care. Republicans were not happy about Trump’s move to reignite the Obamacare wars. Maine GOP Sen. Susan Collins said she “vehemently” disagrees with the Trump move to strike down all of the ACA. I suppose that’s one step above her usual stance of being “concerned,” even if that rarely translates into voting against Trump policies. Democrats often point out that Republican voters and Trump voters in particular often vote against their own self-interests. It doesn’t matter if it’s Trump’s trade war with China, which is hurting farmers and causing some to go bankrupt. Or how changes in EPA regulations on coal-burning plants would worsen air quality the most in the areas of the country where Trump received the most support. Or how Trump’s steel and auto tariffs hurt American car manufacturers, thus hurting the autoworkers who are losing jobs in places like Lordstown, Ohio. Or how GOP lawmakers in red states are working against Medicaid expansion, even when such expansion has been approved by voters. Trump voters are all too willing to believe the Trumpian spiels about an immigrant invasion, how he has supposedly kept his campaign promises, how he’s the “greatest” and “most successful” president in history, and how the William Barr memo means he’s “totally exonerated” from any charges of collusion or obstruction of justice stemming from the Robert Mueller report. Yada yada yada. This list doesn’t even include the wall that Mexico isn’t paying for — and no, the wall hasn’t been started yet, despite the attempts at a “Finish the wall” rallying cry. This chart, from the Henry J. Kaiser Family Foundation, demonstrates the partisan issue gulf in the run-up to the 2018 midterm election. Why worry about health care when there are immigrants to bash? Most of all, what Trump voters care about is Trump. Trump’s approval rating is stuck in the low 40s and is unlikely to fluctuate much, but hard-core Trumpinistas are only too willing to wear red hats, scream, and wave signs at Trump rallies in those safely red districts where he did well in 2016. Trump voters are baked in at this point. The only way to beat them is to turn out and vote in greater numbers, like we did in 2018. Originally posted on Daily Kos on March 31, 2019.